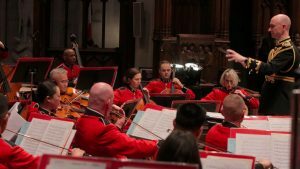 The “President’s Own” Marine Chamber Orchestra participated in the state funeral in honor of former President George H.W. Bush at the Washington National Cathedral. CHARLESTON, W.Va. — More than 60 orchestra members participated in President George H.W. Bush’s funeral Wednesday, but one member had a surprising connection to West Virginia. Master Gunnery Sgt. Aaron Clay, who was born in Fairmont and attended college in the Mountain State, performed at the funeral service, playing the double bass. “It was definitely an interesting and reflective moment in my career,” Clay said.